The Republic of Iraq, commonly known as Iraq, is a Middle Eastern country spanning most of the northwestern end of the Zagros mountain range, the eastern part of the Syrian Desert, and the northern part of the Arabian Desert. Iraq is bordered by Jordan to the west, Syria to the northwest, Turkey to the north, Iran to the east, and Kuwait and Saudi Arabia to the south. Iraq has a narrow section of coastline measuring 58 km (36 mi) on the northern Persian Gulf. 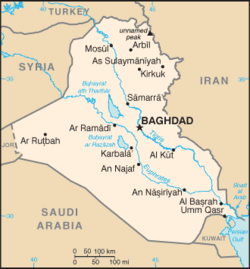 The capital city, Baghdad, is in the center-east of the country. Iraq was known in ancient times as Mesopotamia, the world's first civilization. The ruins of Ur, Babylon, and other ancient cities are there, as well as the legendary location of the Garden of Eden. It was on the banks of the Tigris River, which passes through the capital Baghdad, that writing is believed to have originated. While its proven oil reserves of 112 billion barrels puts Iraq second in world rankings, behind only Saudi Arabia, the United States Department of Energy estimates that up to 90 percent of the country's oil resources remain unexplored. Iraq is an unstable state composed of warring national and tribal groups that are the focus of increased attention from the West as a result of a United States-led invasion in 2003 and the ensuing turmoil. Brought to light since that invasion have been such atrocities as mass murders including soldiers and civilians, men, women and children, committed during the regime of Saddam Hussein. Violence continues, used as a political weapon. Iraq shares borders with Kuwait and Saudi Arabia to the south, Jordan to the west, Syria to the northwest, Turkey to the north, and Iran to the east. It has a very narrow section of coastline at Umm Qasr on the Persian Gulf. At 168,743 square miles (437,072 square kilometers), Iraq is the 58th-largest country in the world, after Morocco. It is comparable in size to the U.S. state of California, and somewhat larger than Paraguay. The country has four main regions: the desert in the west and southwest; the rolling upland between the upper Tigris and Euphrates rivers (in Arabic the Dijlis and Furat, respectively); the highlands in the north and northeast; and the alluvial plain through which the Tigris and Euphrates flow. Close to the coast and along the Shatt al-Arab there were once marshlands, but many of these were drained in the 1990s. The highest point is an 11,847-foot (3611-meter) point known locally as Cheekah Dar (black tent). The climate is mostly desert with mild to cool winters and dry, hot, cloudless summers. The northern mountainous regions have cold winters with occasional heavy snows, sometimes causing extensive flooding. Average temperatures range from higher than 120°F (48°C) in July and August to below freezing in January. Most of the rainfall occurs from December until April and averages between four to seven inches (100mm and 180mm) annually. The Tigris River near Mosul. The two main rivers are the Euphrates and Tigris. The Euphrates originates in Turkey, is augmented by the Khabur River in Syria, and flows through Iraq from the northwest to join the Tigris at Al Qurnah. The Tigris also rises in Turkey, is significantly augmented in Iraq by the Khabur River, the Great Zab, the Little Zab, and the Uzaym, above Baghdad, and the Diyala, which joins it below the city. At the Kut Barrage much of the water is diverted into the Shatt al Gharraf, which was once the main channel of the Tigris, and into the Euphrates above the confluence of the two main channels at Al Qurnah. The two rivers carry about 78 million cubic yards (60 million cubic meters) of silt annually to the delta. The combination of rain shortage and extreme heat makes much of Iraq a desert. Because of high rates of evaporation, soil and plants rapidly lose the little moisture obtained from the rain, and vegetation could not survive without extensive irrigation. Some areas, however, although arid, do have natural vegetation, in contrast to the desert. For example, in the Zagros Mountains in north-eastern Iraq there is permanent vegetation, such as oak trees, and date palms are found in the south. Natural hazards include dust storms, sandstorms, and floods. Government water control projects have drained most of the inhabited marsh areas east of Nasiriyah, thus displacing a once sizable population of Marsh Arabs, who inhabited these areas for thousands of years. Other environmental problems include inadequate supplies of drinking water, air and water pollution, soil degradation (salination) and erosion, and desertification. While its proven oil reserves of 112 billion barrels is the second largest in the world, behind only Saudi Arabia, according to the United States Department of Energy, unexplored regions of Iraq could yield an additional 100 billion barrels. Iraq's oil production costs are among the lowest in the world. However, only about 2000 oil wells have been drilled in Iraq, compared to about one million wells in Texas. Almost 75 percent of Iraq's population lives in the flat, alluvial plain stretching southeast from Baghdad to Basra and the Persian Gulf. Baghdad, the capital, has a metropolitan area population of seven million people. It is the largest city in Iraq, and the second-largest city in southwest Asia (after Tehran). Baghdad has at least 12 bridges to join the east and west of the city separated by the river Tigris. Other cities include Basra in the south and Mosul in the north. There are several suggested origins for the name Iraq. One dates to the Sumerian city of Uruk (or Erech); another posits that Iraq comes from the Aramaic language, meaning "the land along the banks of the rivers;" another, that Iraq refers to the root of a palm tree common in the country. Under the Persian Sassanid dynasty, there was a region called "Erak Arabi," referring to the part of the south western region of the Persian Empire that is now part of southern Iraq. The name Al-Iraq was used by the Arabs themselves, from the sixth century, for the land Iraq covers. Iraq was historically known as Mesopotamia, which, in Greek, literally translates to "between the rivers." The region was one of the famous four river civilizations, along with the Nile valley in Egypt, the Indus Valley in the Indian Subcontinent and Yellow River valley in China, and is one of the 15 Cradle of Civilization countries. The Tigris and Euphrates rivers are mentioned in the Book of Genesis in The Bible, in connection with a river that flowed out of the Garden of Eden, although further analysis would locate the garden in the Taurus Mountains, in Anatolia. The world's first known civilization, the Sumerian culture, flourished in Iraq around 3000 B.C.E. The Sumerians built irrigation systems, developed cereal agriculture, invented the earliest known form of writing, developed a system of mathematics upon which timekeeping in the modern world is based, invented the wheel, and the first plow. Their literature included the first known recorded story, the Epic of Gilgamesh. Sumerians believed in private property, still an important notion in Iraq today. In 2340 B.C.E., the great Akkadian leader Sargon of Akkad conquered Sumer and built the Akkadian Empire, stretching over most of the Sumerian city-states and extending as far away as Lebanon. The Akkadians were a Semitic people, who had migrated from the Arabian Peninsula. In 2125 B.C.E., the Sumerian city of Ur in southern Mesopotamia rose up in revolt. 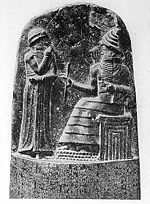 King Hammurabi of Babylon (1792-1750 B.C.E.) re-united the region. Babylonian rule covered most of the Tigris-Euphrates river valley from Sumer and the Persian Gulf, and extended to the coast of the Mediterranean Sea. The Assyrians (ca 2000 B.C.E. to 700 B.C.E.) came to control Babylonia, until revolts in turn deposed them and set up a new dynasty, known as the Second Dynasty of Isin. Nebuchadnezzar I (c. 1119 B.C.E. to 1098 B.C.E.) is the best-known ruler from this dynasty. Eventually, during the 800s B.C.E., a powerful tribe from outside Babylon, the Chaldeans, rose to power in Babylonia, which came to be known as Chaldea. In 626 B.C.E., the Chaldeans helped Nabo-Polassar to take power in Babylonia. At that time, Assyria was under considerable pressure from the Iranian Medes. Nabopolassar allied Babylonia with the Medes. In 612 B.C.E., the city of Nineveh, once the capital of the great Assyrian empire, was burned and sacked. Nebuchadnezzar II (604-562 B.C.E. ), who was Nabopolassar's son, inherited the empire of Babylonia. In 586 B.C.E., Nebuchadnezzar II conquered Judea, destroyed Jerusalem, including Solomon's Temple, and sent an estimated 15,000 captives into exile in Babylonia. Nebuchadnezzar is credited for building the legendary Hanging Gardens of Babylon, one of the Seven Wonders of the World. Mesopotamia was the location of the historically significant cities of Uruk (ca 4000 B.C.E.-3100 B.C.E. ), Nippur (from 5000 B.C.E. ), Nineveh (ca 1800 B.C.E.-612 B.C.E. ), Babylon (ca 2000 B.C.E.-275 B.C.E. ), and Ur (ca 2119 B.C.E.-2004 B.C.E.). Boat on the Euphrates River. Various invaders conquered the land after Nebuchadnezzar's death, including Persian Cyrus the Great in 539 B.C.E. and Alexander the Great in 331 B.C.E., who later died there in 323 B.C.E. It remained under Greek rule under the Seleucid dynasty for nearly two centuries. Babylon declined after the founding of Seleucia on the Tigris, the new Seleucid Empire capital. A Central Asian tribe of Iranian peoples called Parthians then annexed the region followed by the Sassanid Persians until the seventh century C.E. The desert frontier of greater Iran had been guarded by the Lakhmid kings of Al-Hirah, who were Arabs ruling a settled buffer state. In 602 C.E.,Shahanshah Khosrow II Aparviz rashly abolished the Lakhmid kingdom and laid the frontier open to nomad incursions. Beginning in the seventh century C.E., Islam spread to what is now Iraq during the Islamic conquest of Persia, led by the Muslim Arab commander Khalid ibn al-Walid. Under the Rashidun Caliphate, the prophet Mohammed's cousin and son-in-law, Ali, moved his capital to Kufa "fi al-Iraq" when he became the fourth caliph. 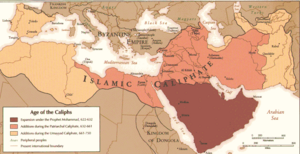 The Umayyad Caliphate, ruling from Damascus in the seventh century, ruled the province of Iraq. The city of Baghdad was built in the eighth century as the capital of the Abbasid Caliphate, and became the leading city of the Arab and Muslim world for five centuries. Baghdad was the largest multicultural city of the Middle Ages, peaking at a population of more than a million, and was the center of learning during the Islamic Golden Age, until its eventual destruction during the Battle of Baghdad in 1258. 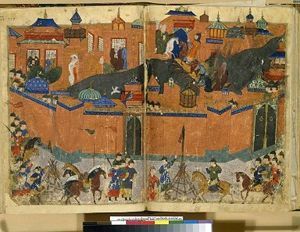 In 1257, Hulagu Khan amassed an unusually large army, perhaps 10 percent of all available Mongol fighters, for the purpose of conquering Baghdad. When they arrived at the Islamic capital, Hulagu demanded surrender but the caliph refused. This angered Hulagu, and, consistent with Mongol strategy of discouraging resistance, Bagdhad was decimated. Estimates of the numbers killed range from 200,000 to a million. The Grand Library of Baghdad, containing countless precious historical documents was destroyed along with the Abbasid Caliphate. The caliph was captured, was forced to watch as his citizens were murdered and his treasury plundered, and was killed by trampling. The Mongols rolled the caliph up in a rug, and rode their horses over him, as they believed that the earth was offended if touched by royal blood. All but one of his sons were killed. The canals and dikes forming the city's irrigation system were destroyed. Baghdad was a depopulated, ruined city for several centuries and only gradually recovered some of its former glory. At this point Baghdad was ruled by the Il-Khanids, the Mongol emperors of Iran. In 1401, Baghdad was again sacked, by Timur ("Tamerlane"). It became a provincial capital controlled by the Jalayirid (1400–1411), Qara Quyunlu (1411–1469), Aq Quyunlu (1469–1508), and Safavid (1508–1534) dynasties. The Ottoman Empire took Baghdad in 1535, cementing Suleiman I as the leader of the Islamic world. Ottoman rule lasted until World War I, during which the Ottomans sided with Germany. The British drove the Ottomans from much of the area during World War I. The British lost 92,000 soldiers in the Mesopotamian campaign, and captured 45,000 prisoners of war. The British and French divided the Middle East in the Sykes-Picot Agreement. The Treaty of Sèvres, which was ratified in the Treaty of Lausanne, led to the advent of the modern Middle East and Republic of Turkey. The League of Nations granted France mandates over Syria and Lebanon and granted the United Kingdom mandates over Iraq and Palestine (which then consisted of two autonomous regions, Palestine and Transjordan). Parts of the Ottoman Empire on the Arabian Peninsula became parts of what would eventually be Saudi Arabia and Yemen. The British mandate of Mesopotamia was formed out of three former Ottoman vilayets (regions): Mosul, Baghdad, and Basra, which the Ottomans ruled from Baghdad. British armed forces put down any rebellion. Hashemite king, Faisal I, who had been forced out of Syria by the French, was selected to be client ruler for the British, while government officials were selected from the Sunni Arab elite in the region. In March 1925, the British-controlled Turkish Petroleum Company, that had held concessionary rights to the Mosul province, was renamed as the Iraq Petroleum Company and granted a concession for 75 years. Iraq was granted independence in 1932 on the urging of King Faisal, though the British retained military bases and transit rights. King Ghazi ruled as a figurehead after King Faisal's death in 1933, while undermined by attempted military coups, until his death in 1939. The United Kingdom invaded Iraq in 1941 for fear that the government of Rashid Ali might cut oil supplies to Western nations, and because of strong idealogical leanings to Nazi Germany. A military occupation followed the restoration of the Hashemite monarchy, and the occupation ended on October 26, 1947. Nuri al-Said, was the autocratic prime minister, who also ruled from 1930-1932, and Abd al-Ilah, was an adviser to the king Faisal II. In 1958, the Iraqi Army overthrew the reinstated Hashemite monarchy in a coup known as the July 14 Revolution, and brought Brigadier General Abdul Karim Qassim to power. He withdrew from the Baghdad Pact and established friendly relations with the Soviet Union. But his government lasted only until 1963, when it was overthrown by Colonel Abdul Salam, who died in 1966, when his brother, Abdul Rahman Arif, then assumed the presidency. In 1968, the Arab Socialist Ba’ath Party, under the leadership of General Ahmed Hassan al-Bakr, seized power. Through the 1970s, the economy boomed as a result of the high prices of oil. The vice-president to the elderly al-Bakr, Saddam Hussein, spearheaded Iraq's nationalization of the Western-owned Iraq Petroleum Company, and cemented his authority over the apparatuses of government. Th Ba’ath Party gradually came under the control of Saddam Hussein al-Majid al Tikriti, who acceded to the presidency and control of the Revolutionary Command Council, then Iraq's supreme executive body, in July 1979, while killing off many of his opponents. 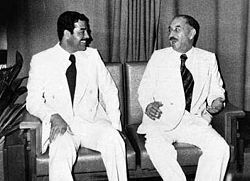 Saddam Hussein saw himself as a social revolutionary and a modernizer, following the pattern set by Egyptian President Gamal Abdel Nasser. To the consternation of Islamic conservatives, his government gave women added freedoms and offered them high-level government and industry jobs. He created a Western-style legal system, making Iraq the only country in the Persian Gulf region not ruled according to traditional Islamic law (Sharia). Saddam Hussein abolished the Sharia law courts, except for personal injury claims. His government rested on the support of the 20 percent minority of largely working class, peasant, and lower middle class Sunnis, continuing a pattern that dates back to the British mandate authority's reliance on them as administrators. 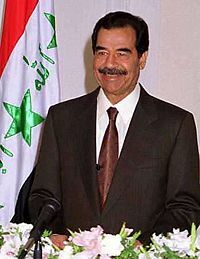 Saddam Hussein claimed a unique role for Iraq in the history of the Arab world. As president, Saddam made frequent references to the Abbasid period, when Baghdad was the political, cultural, and economic capital of the Arab world. He promoted Iraq's pre-Islamic role as Mesopotamia, the ancient cradle of civilization, alluding to such historical figures as Nebuchadnezzar II and Hammurabi. He devoted resources to archaeological explorations. Thousands of portraits, posters, statues and murals were erected in Saddam Hussein’s honor all over Iraq. His face could be seen on the sides of office buildings, schools, airports, and shops, as well as on Iraqi currency. This personality cult reflected his efforts to appeal to the various elements in Iraqi society. He appeared in the costumes of the Bedouin, the traditional clothes of the Iraqi peasant (which he wore during his childhood), and even Kurdish clothing, but also appeared in Western suits, projecting the image of an urbane and modern leader. Sometimes he would also be portrayed as a devout Muslim, wearing full headdress and robe, praying toward Mecca. Saddam's regime lasted throughout the Iran-Iraq War (1980–1988), during which Iraqi forces attacked Iranian soldiers and civilians with chemical weapons. The war ended in stalemate. This period is notorious for the Saddam regime's human rights abuses. Any nuclear ambitions had been thwarted in 1981, when Israeli aircraft bombed the Osiraq nuclear research center, near Baghdad, to prevent the regime from using the reactor for creation of nuclear weapons. On August 2, 1990, Iraq invaded Kuwait, following Iraqi contentions that Kuwait was illegally slant-drilling petroleum across Iraq’s border. The UN immediately imposed economic sanctions against Iraq, and five days later, the United States began to deploy forces to Saudi Arabia. By the time the fighting (Operation Desert Storm) began on January 17, 1991, 12 nations sent naval forces, eight sent ground forces and four sent air forces to join forces from Kuwait, Saudi Arabia, Bahrain, Qatar and Oman against 545,000 Iraqi ground troops. The Gulf War was a heavily televised war. For the first time people all over the world were able to watch live pictures of missiles hitting their targets and fighters taking off from aircraft carriers. Allied forces were keen to demonstrate the accuracy of their weapons. The Coalition advance was much swifter than U.S. generals had expected. On February 26, 1991, Iraqi troops began retreating out of Kuwait, setting fire to Kuwaiti oil fields as they left. A long convoy of retreating Iraqi troops formed along the main Iraq-Kuwait highway. This convoy was bombed so extensively by Coalition aircraft that it came to be known as the Highway of Death. At the peace conference, Iraq won the approval of the use of armed helicopters on their side of the temporary border, ostensibly for government transit due to the damage done to civilian transportation. Soon after, these helicopters, and much of the Iraqi armed forces, were refocused toward fighting against a Shiite uprising in the south. The rebellions were encouraged on February 2, 1991, by a broadcast on CIA run radio station The Voice of Free Iraq broadcasting out of Saudi Arabia. The Arabic service of the Voice of America supported the uprising by stating that the rebellion was large and that they soon would be liberated from Saddam. The economic sanctions were intended to compel Saddam to dispose of weapons of mass destruction. Critics estimate that more than 500,000 Iraqi children died as a result of the sanctions. The U.S. and the United Kingdom declared no-fly zones over Kurdish northern and Shiite southern Iraq to oversee the Kurds and southern Shiites. Downtown Baghdad monument of Saddam Hussein vandalized by Iraqis shortly after the Occupation of Coalition Forces in April 2003. Iraq was invaded in March 2003 by a United States-organized coalition, with the stated reason that Iraq had not abandoned its nuclear and chemical weapons development program according to United Nations resolution 687, adopted when Iraq invaded Kuwait. Public justifications for the invasion included purported Iraqi government links to Al Qaeda, claims that Iraq had weapons of mass destruction, and the opportunity to remove an oppressive dictator and to bring democracy to Iraq. In his State of Union Address on January 29, 2002, American President George W. Bush declared that Iraq was a member of the "axis of evil"; and that, like North Korea and Iran, Iraq's attempt to acquire weapons of mass destruction gave credentials to the claim that the Iraqi government posed a serious threat to America's national security. Approximately 120,000 soldiers and Marines from the United States, and 45,000 from the United Kingdom, as well as smaller forces from five other nations, collectively called the "Coalition of the Willing," were deployed to several staging areas in Kuwait. Coalition forces managed to topple the government and capture the key cities of a large nation in only 21 days, taking minimal losses while also trying to avoid large numbers of civilian and Iraqi military deaths. The invasion did not require the huge army build-up like the 1991 Gulf War, which numbered half a million Allied troops. This did prove short sighted, however, due to the requirement for a much larger force to combat the irregular Iraqi forces in the post-invasion Iraq. 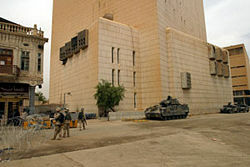 By April 7, the U.S. Army seized the palaces and government offices of central Baghdad, and by April 9, 2003, Baghdad was formally occupied, and Saddam Hussein's rule was declared ended. On May 1, 2003, Bush landed on the aircraft carrier USS Abraham Lincoln, where he gave a speech announcing the end of major combat operations in the Iraq war. But the fall of Baghdad saw the outbreak of regional violence, as Iraqi tribes and cities began to fight each other over old grudges and access to economic resources. The Iraqi cities of Al-Kut and Nasiriyah declared war upon each other immediately to establish dominance in the new country, and Coalition forces quickly found themselves embroiled in a potential civil-war. On December 14, 2003, U.S. news of Saddam Hussein’s capture at a farmhouse in ad-Dawr near Tikrit was released. He was charged with crimes committed against residents of Dujail in 1982, following a failed assassination attempt against him. Specific charges included the murder of 148 people, torture of women and children and the illegal arrest of 399 others. On December 30, 2006, Saddam Hussein was hanged. Hussein's half-brother and former intelligence chief Barzan Ibrahim al-Tikriti and former chief judge of the Revolutionary Court Awad Hamed al-Bandar were likewise executed on January 15, 2007, as was Taha Yassin Ramadan, Saddam's former deputy and former vice-president (originally sentenced to life in prison but later to death by hanging), on March 20, 2007. Ramadan was the fourth and last man in the al-Dujail trial to die by hanging. The United States established the Coalition Provisional Authority to govern Iraq. Government authority was transferred to an Iraqi Interim Government in 2004 and a permanent government was elected in October 2005. More than 140,000 Coalition troops remain in Iraq. Studies have placed the number of civilian deaths as between 65,500 and 655,000. After the invasion, al-Qaeda took advantage of the insurgency to entrench itself in the country concurrently with a Arab-Sunni led insurgency and sectarian violence. In 2006 Foreign Policy Magazine named Iraq as the fourth most-unstable nation in the world. An Iraqi woman mourns next to remains of bodies exhumed from a mass grave. Mass graves in Iraq have become well known since the U.S. led invasion. Mass graves are unmarked sites containing at least six bodies. Some can be identified by mounds of earth piled above the ground or as deep pits that appear to have been filled. Some older graves are more difficult to identify, having been covered by vegetation and debris over time. Sites have been discovered in all regions of the country and contain members of every major religious and ethnic group in Iraq as well as foreign nationals, including Kuwaitis and Saudis. Over 250 sites have been reported, of which approximately 40 had been confirmed by 2007. Over one million Iraqis are believed to be missing in Iraq as a result of executions, wars and defections, of whom hundreds of thousands are thought to be in mass graves. Most of the graves discovered to date correspond to one of five major atrocities perpetrated by the regime. The 1983 attack against Kurdish citizens belonging to the Barzani tribe, 8000 of whom were rounded up by the regime in northern Iraq and executed in deserts at great distances from their homes. The 1988 Anfal campaign, during which as many as 182,000 people disappeared. Most of the men were separated from their families and were executed in deserts in the west and southwest of Iraq. The remains of some of their wives and children have also been found in mass graves. Chemical attacks against Kurdish villages from 1986 to 1988, including the Halabja attack, when the Iraqi Air Force dropped sarin, VX, and tabun chemical agents on the civilian population, killing 5000 people immediately and causing long-term medical problems, related deaths, and birth defects among the progeny of thousands more. The 1991 massacre of Iraqi Shia Muslims after the Shia uprising at the end of the Gulf war, in which tens of thousands of soldiers and civilians in Basra and Al-Hillah were killed. A massacre of Kurds in 1991, which targeted civilians and soldiers who fought for autonomy in northern Iraq after the Gulf war, also resulted in mass graves. On December 23, 2005, a Dutch court sentenced Frans van Anraat, a businessman who bought chemicals on the world market and sold them to Saddam Hussein's regime, to 15 years in prison. The Dutch court ruled that Saddam Hussein committed genocide against the people of Halabja, which was the first time a court described the use of chemical weapons against the people of Halabja as genocide. The politics of post-invasion Iraq takes place in a framework of a more or less federal parliamentary representative democratic republic, whereby the prime minister is the head of government, and of a pluriform multi-party system. According to the 2005 constitution, the executive branch of government comprises the Prime Minister, Nouri al-Maliki (in 2007), who holds most of the executive authority and appoints the cabinet, and the president—Jalal Talabani in 2007—who serves in a figurehead capacity, with few powers. The president and vice presidents comprise the Presidency Council, which appoints a 37-minister cabinet. The constitution includes a bicameral legislative body, or parliament. The lower house is the Council of Representatives, consisting of 275 members of parliament, elected nationwide by a closed-list, proportional representation system. Elections, held on December 15, 2005, resulted in the Unified Iraqi Alliance taking 41 percent of the vote, Kurdistan Alliance 22 percent, Tawafuq Coalition 15 percent, Iraqi National List 8 percent, Iraqi Front for National Dialogue 4 percent, and other, 10 percent. The speaker was to be elected by the House. According to the constitution, the upper house would be the Council of Union, and the members would be known as senators. It would have 50 senators from each Sunni, Kurdish, and Shia senatorial districts. The president of the senate would be a vice president in the Presidency Council chosen by the president. The constitution calls for a Federal Judicial Authority, comprised of the Higher Juridical Council, Supreme Federal Court, Federal Court of Cassation, Public Prosecution Department, Judiciary Oversight Commission, and other federal courts to be regulated in accordance with the law. Before the fall of Saddam Hussein in 2003, the Ba'ath Party officially ruled Iraq through a nine-member Revolutionary Command Council, which enacted legislation by decree. The council's president (chief of state and supreme commander of the armed forces) was elected by a two-thirds majority of the council. A council of ministers (cabinet), appointed by the council, had administrative and some legislative responsibilities. A 250-member National Assembly consisting of 220 elected by popular vote who served a four-year term, and 30 appointed by the president to represent the three northern provinces, was last elected in March 2000. A constitution, voted on by 63 percent of eligible voters on October 15, 2005, was passed with a 78 percent overall majority. The degree of support varied widely, with overwhelming backing among the Shia and Ķurdish communities, but overwhelming rejection by Arab Sunnis. Three majority Arab Sunni provinces rejected it (Salah ad Din with 82 percent against, Ninawa with 55 percent against, and Al Anbar with 97 percent against). Under the terms of the constitution, the country conducted fresh nationwide parliamentary elections on December 15 to elect a new government. The majority of all three main ethnic groups in Iraq voted along ethnic lines, turning the vote into more of an ethnic census than a competitive election, and setting the stage for the division of the country along ethnic lines. Iraqi politicians have been under significant threat by the various factions that have promoted violence as a political weapon. An insurgency against the Government of Iraq and Coalition forces is concentrated in Baghdad and in areas north, northeast, and west of the capital. The diverse, multi-group insurgency consists principally of Sunni Arabs—whose only common denominator is a shared desire to oust the Coalition and end U.S. influence in Iraq—a number of predominantly Shia militias, and some associated with political parties, challenge governmental authority in Baghdad and southern Iraq. 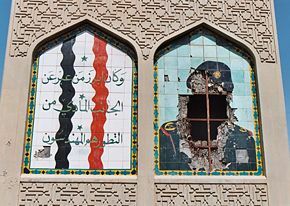 The capital of Baghdad was in the middle of a power struggle in 2007, with insurgents forcing out Shi'ite residents in some areas of western Baghdad where the Sunni sect is in the majority. After the bombing of a Shi'ite shrine in Samarra, north of Baghdad, Shi'ite militias retaliated and forced out some Sunnis from predominantly Shi'ite areas. There are a number of ethnic minority groups in Iraq: Kurds, Assyrians, Mandeans, Iraqi Turkmen, Shabaks and Roma people. These groups have not enjoyed equal status with the majority Arab populations throughout Iraq's 85-year history. Since the establishment of the "no-fly zones" following the Gulf War of 1990-1991, the situation with the Kurds has changed as they established their own autonomous region. The remainder of these ethnic groups continue to suffer discrimination on religious or ethnic grounds. 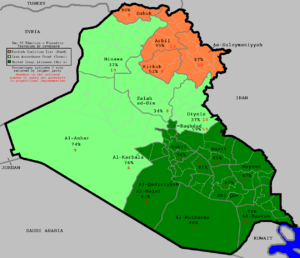 Iraq is divided into 18 governorates (or provinces). The governorates are subdivided into qadhas (or districts). The new constitution provides for regions to be created by combining one or more governorates. There was only one region in existence in 2007—Iraqi Kurdistan—and there are proposals for one or more further regions to be created in the south. 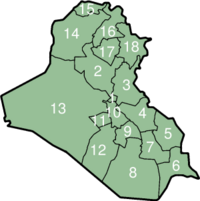 The 2007 governorates were: Baghdad, 1; Salah ad Din, 2; Diyala, 3; Wasit, 4; Maysan, 5; Al Basrah, 6; Dhi Qar, 7; Al Muthanna, 8; Al-Qādisiyyah, 9; Babil, 10; Karbala, 11; An Najaf, 12; Al Anbar, 13; Ninawa, 14; Dahuk, 15; Arbil, 16; At Ta'mim (Kirkuk), 17; and As Sulaymaniyah, 18. A Rendering of Tahrir Square, the first phase of the Baghdad Renaissance Plan, a private investment reconstruction effort. Iraq's formal economy is dominated by the oil sector, which has traditionally provided about 95 percent of foreign exchange earnings. In the 1980s, financial problems caused by massive expenditures (at least US$100 billion) in the eight-year war with Iran and damage to oil export facilities by Iran led the government to implement austerity measures, borrow heavily, and later reschedule foreign debt payments. After hostilities ended in 1988, oil exports gradually increased with the construction of new pipelines and restoration of damaged facilities. A combination of low oil prices, repayment of war debts (estimated at around US$3 billion a year) and the costs of reconstruction resulted in a financial crisis which was the main short-term motivation for the invasion of Kuwait. 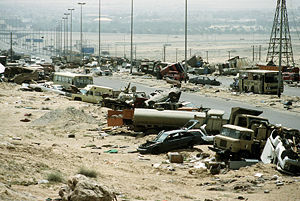 Iraq's seizure of Kuwait in August 1990, subsequent international economic sanctions, and damage from military action by an international coalition beginning in January 1991 drastically reduced economic activity. Although government policies supporting large military and internal security forces and allocating resources to key supporters of the regime hurt the economy, implementation of the UN's oil-for-food program, which began in December 1996, helped improve conditions for the average Iraqi citizen. Iraq was allowed to export limited amounts of oil in exchange for food, medicine, and some infrastructure spare parts. In December 1999, the UN Security Council authorized Iraq to export under the program as much oil as required to meet humanitarian needs. The military victory of the US-led coalition in March-April 2003 resulted in the shutdown of much of the central economic administrative structure. Although a comparatively small amount of capital plant was damaged during the hostilities, looting, insurgent attacks, and sabotage have undermined efforts to rebuild the economy. Attacks on key economic facilities—especially oil pipelines and infrastructure—have prevented Iraq from reaching projected export volumes, but total government revenues have been higher than anticipated due to high oil prices. On November 20, 2004, the Paris Club of creditor nations agreed to write off 80 percent ($33-billion) of Iraq's $42-billion debt to club members. Iraq's total external debt was around $120-billion at the time of the 2003 invasion, and had grown by $5 billion by 2004. Despite political uncertainty, Iraq is making some progress in building the institutions needed to implement economic policy. An International Compact with Iraq is being established to integrate Iraq into the regional and global economy, while recognizing the need to resolve destabilizing security and political conflicts. Additionally, the Iraqi government is seeking to pass laws to strengthen the economy. This legislation includes a hydrocarbon law to encourage contracting with foreign investors and a revenue sharing law to equitably divide oil revenues within the nation. Controlling inflation, reducing corruption, and implementing structural reforms such as bank restructuring and developing the private sector, will be key to Iraq's economic prospects. The concept of private property has a long history in Iraq. Introduced by the Sumerians, the concept was re-introduced in the late nineteenth century, transforming Iraq from a feudal society, where sheikhs provided spiritual and tribal leadership, to a society separated between landowners and sharecroppers. While under sanctions during the 1990s, many people sold their land to the government to buy food and medicine. Exports totaled $32.19 billion in 2006. Export commodities included crude oil (84 percent), crude materials excluding fuels (8 percent), and food and live animals (5 percent). Export partners were the U.S. (49.7 percent), Italy (10.4 percent), Spain (6.3 percent), and Canada (5.6 percent). Imports totaled $20.76-billion. Import commodities were food, medicine, and manufactures. Import partners were Turkey (23.4 percent), Syria (23.1 percent), the U.S. (11.7 percent), Jordan (6.3 percent). Per capita GDP was $2900 in 2006. The unemployment rate was 25 percent to 30 percent in 2005. The growth and dynamics of the informal economy. The loss of social capital through emigration and disrupted education. The evolving relationship between tribes, gangs, and insurgency. Progress in one or two of these areas will not bring economic stability, but all must be address simultaneously. A 2011 estimate of the total Iraqi population is 30,399,572. The Sadr City district of the capital Baghdad is the most densely populated area in Iraq, and is home to around two million impoverished Shi'ite Muslims. Life expectancy for the total population was 69.01 years in 2007. An oil-fueled economic boom that hit Iraq in the 1970s brought a migration to urban centers. Rural dwellers clustered near the rivers, streams, and irrigation canals as nucleated settlements rather than dispersed farmsteads. The Marsh Arabs (the Madan) of the south lived in small clusters of two or three houses kept above water by rushes. Some of these people are water buffalo herders and lead a semi-nomadic life. There have been many large-scale waves of emigration from Iraq, beginning early in the regime of Saddam Hussein and continuing through to 2007. The UN High Commission for Refugees has estimated that nearly two million Iraqis have fled the country in recent years, mostly to Jordan and Syria. Although some expatriates returned to Iraq after the 2003 invasion, the flow had virtually stopped by 2006. Seventy-four percent of Iraq's population are Arabs; the other major ethnic groups are the Kurds at 22 to 24 percent, Assyrians, Iraqi Turkmen, and others (5 percent), who mostly live in the north and northeast of the country. Other distinct groups are Persians and Armenians. About 25,000 to 60,000 Marsh Arabs live in southern Iraq. The Kurds continually battle the majority Arabs, and the Turkomans, in the northern mountainous areas, have existed as buffers between Arab and Kurdish areas. The Yazidis are of Kurdish descent, but have a unique religion. The Assyrians descend from the ancient Mesopotamian people, speak Aramaic, and are Christian. There are no official figures on religious affiliation available, mainly due to the highly politically charged nature of the subject. 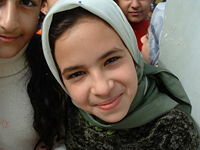 Ninety seven percent of the total population is Muslim, and the remaining three are classified as Christian or other. The CIA World Fact Book analyzes the Muslim population as comprising Shi'a 60 percent-65 percent, and Sunni 32 percent -37 percent. The Shi'ites are mostly Arabs, with some Turkmen and Faili Kurds, and almost almost all are of the Twelver school. Sunni Muslims comprise Arabs, Turkmen, who are Hanafi school, and Kurds, who are Shafi school. Sunnis hotly dispute these figures, claiming that many sources only include Arab Sunnis as "Sunni," missing out the Kurdish and Turkmen Sunnis. Some argue that the 2003 Iraq Census shows that Sunnis were a slight majority, with Sunnis making 59 percent of the population, and Shi’ites 40 percent. Ethnic Assyrians (most of whom are adherents of the Chaldean Catholic Church and the Assyrian Church of the East) account for most of Iraq's sizable Christian population, along with Armenians. Bahá'ís, Mandaeans, Shabaks, and Yazidis also exist. Most Kurds are Sunni Muslims, although the Faili (Feyli) Kurds are largely Shi'a. Most Shi'as accept that Imam Ali, the Prophet Muhammad's cousin and son-in-law, who was the first Shi’a Imam and the fourth Sunni Caliph, was buried at a secret location at what is now the city of Najaf, which grew around the mosque and shrine called Masjid Ali. Long before Saddam Hussein, Iraq had been split along social, ethnic, religious, and economic fault lines: Sunni versus Shi'ite, Arab versus Kurd, tribal chief versus urban merchant, nomad versus peasant. Stable rule in a country rife with factionalism required both massive repression and the improvement of living standards. Arabic, a Semitic language introduced by the Arab conquerors, is the official language. Having three different forms, classical Arabic is the written language of the Qur'an, modern standard Arabic is taught in schools for reading and writing, and spoken Iraqi Arabic is similar to that spoken in Syria, Lebanon, and parts of Jordan. Kurdish, another official language, is the language in Kurdistan, and is a distinct language from the Indo-European family. Assyrian and Turkmen are official languages in areas where the Assyrians and Iraqi Turkmen are located respectively. Armenian and Persian are also spoken but to a lesser extent. English is the most commonly spoken Western language. An Iraqi girl living next to Al Daura Oil Refinery. During the Iran-Iraq War, women studied and worked in fields normally filled by men. Under the Ba’athist regime, a government organization known as the General Federation for Iraqi Women had a branch in each province, and had a stated aim of promoting literacy and higher education for women. Iraq was the first Arab country to elect a woman to a parliamentary position, although many believed she was given the position to show that Saddam Hussein’s regime was progressive. Traditionally, girls are taught the value of weakness, naïveté, resignation, and passivity. Boys spend time with men from an early age to learn about authority and dominance. Arranged marriages have become rare. The Muslim majority views marriage as a contract between two families. In urban areas, couples tend to choose their spouses, although parental approval is required. The loss of men in the Iran-Iraq War prompted the government to provide grants to men to marry war widows to increase the population. Polygamy became more common. Divorce is easy for a husband but difficult for a wife to initiate. Custody is granted based on what is best for the child. Intermarriage between different religious and tribal groups was quite common under Saddam Hussein's rule, but many of these marriages have been disrupted as a result of tribal infighting after the 2003 invasion. Economic hardships mean that families tend to live with extended households, including the older couple, sons, their wives and families, unmarried daughters, and possibly other dependent relatives. The oldest male heads the group, manages property and decides upon their children’s education, occupations, and marriage partners. Women share household and child-rearing tasks. Following the Islamic rule, a man inherits twice as much as a woman, since he must provide protection for the woman. Large kin groups are more important than ethnic, social class, and sectarian lines. Family loyalty is essential, and family members protect each other. The kin group involves three generations who tend to live together and cooperate in agriculture and land ownership. A boy's birth is celebrated, while a girl's is not, since the boy is thought to be more valuable, given his potential to work, while the girl is considered more of a dependent. At puberty girls are separated from boys and have less freedom. A good child is loyal and obedient. Premarital chastity is stressed. Education is free, and six years of primary education are compulsory. Many children in rural areas do not attend schools because facilities are not available. Instruction is mostly in Arabic, although Kurdish is used in schools in some northern districts. In 2003, 40.4 percent of Iraqis aged 15 or older were literate, while in the 1980s the literacy rate was about 80 percent. In the 1998–1999 year, 3.1-million pupils attended 8145 primary schools, and 619,114 students were enrolled in around 4000 secondary schools. At tertiary level, about 135,700 students attended 310 vocational or teacher-training institutions. Iraq has 15 universities, and a number of technical institutes. Higher education was greatly prized, and the state used to pay for it, even literacy classes for adults. Many schools were destroyed during the war and its aftermath. The Coalition Provisional Authority estimated that 2500 schools were reconstructed since the end of the war and that school attendance had returned to pre-war levels. Arabs, Kurds, and other ethnic groups each have their own social stratification. There continues to be a great disparity between rich and poor. Under the Ba’athist regime, those in the high class were connected to or favored by the government, since government approval was required to start a business. The once-dominant middle class deteriorated under economic crisis, when well-educated people came to perform unskilled labor. Ishtar Gate (Bab Ishtar) 604 to 562 B.C.E., Ancient Babylon. Many treasures of Mesopotamian archaeology were housed in the Baghdad Museum until 2003, when they were lost to looting and vandalism during the chaos that accompanied the 2003 invasion of Iraq by the United States and its allies. The number and value of stolen items are disputed. A campaign was launched soon after the loss, with the help of the British Museum, to catalog and eventually recover looted works. Appeals by the museum resulted in some items being returned. Others were stolen by criminal gangs with the intent of sale abroad. An aspect of Iraqi etiquette, televised around the world during the 2003 invasion, was the beating of Saddam Hussein's statue after its toppling. Slapping somebody with your shoe, even symbolically, is considered an insult. As in other Arab nations, the left hand is used for sanitary activities and the right hand is used for food and greeting; offering to shake with the left hand may be perceived as an insult, and eating with the left hand embarrassing. The 1970s economic boom brought modern apartment and office buildings to Baghdad. Priority was placed on restoring and building according to historic style. Archaeological sites, mosques, and government buildings were targeted. Traditional features of the style included rooms around an open courtyard, and use of colors, tiles, and arches. Iraq's main food crops include wheat, barley, rice, vegetables, and dates (of which Iraq is one of the world's largest producers). Vegetables include eggplant, okra, potatoes, and tomatoes. Beans such as chickpeas and lentils are also quite common. Common meats in Iraqi cooking are lamb and beef. Fish and poultry are also used. Soups and stews are often prepared and served with rice and vegetables. The traditional diet includes rice with soup or sauce, accompanied by lamb and vegetables. It is traditional to sacrifice a lamb or a goat to celebrate holidays. The Epic of Gilgamesh, an epic poem from Babylonia, is among the earliest known literary works. A series of Sumerian legends and poems about the mythological hero-king Gilgamesh, thought to be a ruler of the third millennium B.C.E., were gathered into a longer Akkadian language poem long afterward, with the most complete version extant today preserved on 12 clay tablets in the library collection of the seventh century B.C.E. Assyrian king Ashurbanipal. The earliest Sumerian versions of the epic date from the Third Dynasty of Ur (2150 B.C.E.-2000 B.C.E. ).The story revolves around the relationship between Gilgamesh, a king who has become disheartened by his rule, and a half-wild friend, Enkidu. Interpreters feel that Gilgamesh was given knowledge of how to worship the gods, of why death was ordained for human beings, of what makes a good king, and of the true nature of how to live a good life. The eleventh tablet contains the flood myth that was mostly copied from the Epic of Atrahasis. Iraqi music has a slow tempo, and features predominantly minor keys. Iraqi maqam is a specific kind of improvised performance, and can be traced as far back as the Abbassid era. There are a number of different maqams, each with their own mood and characteristics. 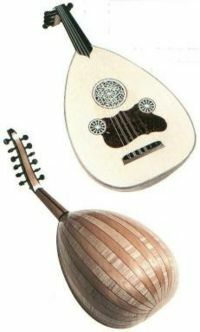 Instruments include qanun, riqq, santur, darbuka, naqqara, ney, djose, and oud. Iraqi music stars include Ahmed Mukhtar and the Assyrian Munir Bashir. Until the fall of Saddam Hussein, the most popular radio station was the Voice of Youth. It played a mix of western rock music, hip hop, and pop music, all of which had to be imported via Jordan due to economic sanctions. Iraq has also produced a pop star-in-exile in Kazem al Saher, whose songs include Ladghat E-Hayya, which was banned for its racy lyrics. Since the 2003 invasion of Iraq, some militant extremists have been attacking musicians, especially those in the port city of Basra, where Shia extremists are believed to be responsible. Basra's sea shanties are well-known throughout Iraq. The most popular sport in Iraq is soccer or football. The Iraq national football team reached the World Cup finals in 1986, and recently they reached the finals of the Asian Games in 2006, defeating former World Cup semi-finalists South Korea in 2006 and eventually losing to Qatar. Football is largely seen as a uniting factor in the country following years of war and unrest. This is the most practiced sport in Iraq. There are at least two basketball leagues, the Iraqi Basketball Association, the country's professional organization, runs a number of adult and youth leagues, and the Premiere League, for elite players. Iraqis also enjoy hockey and swimming, plus a little golf. ↑ 1.0 1.1 Central Intelligence Agency, Iraq The World Factbook. Retrieved December 16, 2011. ↑ 2.0 2.1 2.2 2.3 Iraq. International Monetary Fund. Retrieved December 16, 2011. ↑ Robert F. Looney, "The Iraqi Impasse: Sustaining Economic Reconstruction During War-Time," International Journal on World Peace, vol. xxiii, no. 4 (December 2006): 3-31. Iraq Countries and Their Cultures. Iraq BBC News Country Profile. This page was last modified on 6 March 2018, at 00:22.